Terreece M. Clarke has written for a variety of websites, magazines and newspapers including MyBrownBaby.com, Columbus Parent Magazine and as a YA and children's book reviewer for CommonSenseMedia.org. Her work has garnered the attention of the New York Times, Disney.com and Jezebel.com and her company's digital marketing clients have landed media appearances for national outlets including Fox Business News, BET, CNN, Ebony Magazine, The Root and MSNBC.com. As a successful writer, journalist, entrepreneur, mother of three and wife to one, she is often asked to lead discussions and present on women and parenting issues, business strategies for writers and entrepreneurs and diversity issues including diversity in media, pop culture and tech. "Olivia's Potty Adventures" a potty training storybook featuring an African American character - spent 16 weeks as a #1 Amazon New Release - is the first book in a milestone series featuring children of color. Terreece also has an adult fiction novel that she is in the final throes of finishing. You can find her writing through life on Twitter, Instagram and Facebook - come join the conversation! 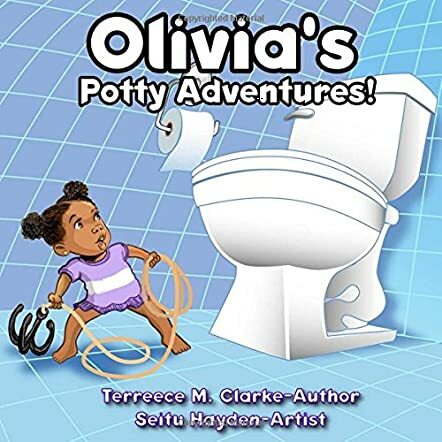 Author Terreece M. Clarke introduces us to Olivia in her children's picture book titled Olivia's Potty Adventures! Olivia is somewhere between the ages of 2 and 3 and is trying to learn how to use the bathroom and when is the right time to do so. The first half of the book, Olivia is so engrossed in her playtime and make-believe that she makes quite a few unfortunate messes! There's no time to stop when the 2 1/2-year-old imagination is at work. Thankfully, Olivia eventually learns how to recognize that "feeling" and learns how to pause her playtime to make a quick break to the bathroom. In the end, she is victorious learning how to survive without her diapers. Olivia's Potty Adventures! is such a great book for small children who are having difficulty with timing. The art in Terreece M. Clarke's book is fun, adorable, and endearing as children will connect to Olivia right away and be transported under the sea, into outer space, and more while following our little heroine into her imagination. And the rhyming scheme is fun and upbeat. I did feel grossed out by the mentions of urine and some urine-filled art, but there are some things you can't avoid discussing when you're trying to teach such an important lesson to a young child. I highly recommend this picture book and think it will make a great addition to any young reader's library.